Detoxifies & Improve Overall Health! Through cleansing and detoxification, you enable your body to better process this toxic load. Reducing the toxic load in your body decreases the risk of developing chronic health problems, improves overall health and immune response, and can increase energy levels. CleanseSMART works to cleanse and detoxify the entire body, but with focus on the body’s two main detoxification pathways – the liver and the colon. CleanseSMART is essential for helping eliminate constipation and improving bowel health. How long can I stay on this cleanse? 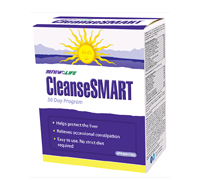 CleanseSMART is a 30 day cleansing program and is not meant to be taken on an ongoing basis. If you would like to use it for longer than 30 days, please speak with your registered health care practitioner. CleanseSMART is for occasional use between 2-4 times per year. Should I make any changes to my diet? Drink 8 – 10 glasses of water per day. Exercise, even if it is only a 30 minute walk. Get plenty of rest (7-8 hours). Eat plenty of fresh organic fruits and vegetables. Eat fish, free range chicken, turkey, or eggs. Eat well cooked grains: brown rice, millet, buckwheat, amaranth, quinoa, spelt, or teff. Eat pasta made from the above grains. Eat raw nuts and seeds. Include FibreSMART and Norwegian Gold Critical Omega as part of this cleansing program. Can I take CleanseSMART if I am also taking medications? Please check the warning on the label of the box for specific contraindications. If you are taking any other medications and are unsure, the best course of action is to consult your pharmacist or registered health care practitioner before starting any herbal cleansing program. If you do decide to perform this cleanse, take your medications at separate times from CleanseSMART (at least 3 hours). After taking CleanseSMART Part 2 how long should I wait before eating? You should wait a minimum of 30 minutes before eating or take the capsules 3 hours after eating. See directions for use on the side of bottle. Directions for Use: Adults: Take 1 capsule of CleanseSMART 1 in the morning and 1 capsule of CleanseSMART 1 midday, take 2 capsules of CleanseSMART 2 in the evening on an empty stomach. Allow 6-12 hours for laxative effect to occur. Continue for 30 days. CleanseSMART is for use between 2-4 times per year. Warnings: Consult a health care practitioner prior to use if you have kidney disorder, diabetes, are taking antiplatelet medication or blood thinners, have stomach ulcers or excess stomach acid, have any cardiac disorder, or are taking heart medication. Consult a health care practitioner if constipation lasts for more than 7 days. Do not use if you have liver or gall bladder disorders, bile duct or bowel obstruction. Do not use if you currently have abdominal pain, nausea, fever, vomiting, hemorrhoids, or chronic gastrointestinal disorders. 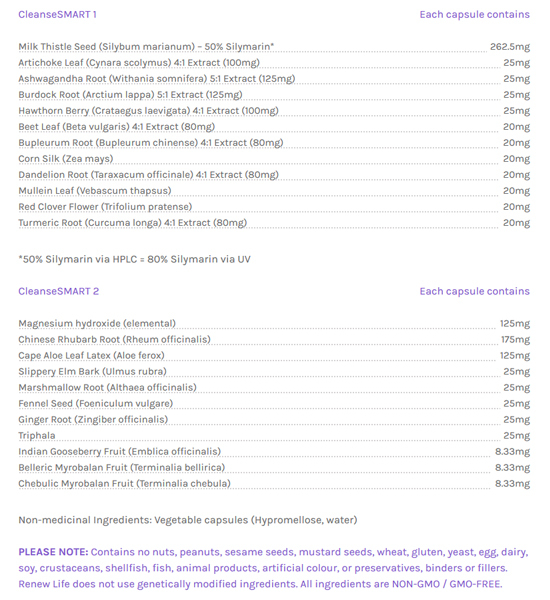 Do not use if you are currently taking licorice root, thiazide diuretics, corticosteroids, or drugs that may aggravate electrolyte imbalance. Discontinue use if you develop signs of liver trouble (such as abdominal pain, dark urine or jaundice). Do not use if you are allergic to anethole, plants of the Asteraceae/Compositae/Daisy family, or Apiaceae/Carrot family. Hypersensitivity, such as allergy, is known to occur; in which case, discontinue use. Consumption with alcohol, other drugs or natural health products with sedative properties is not recommended. Reduce dose or discontinue use if abdominal cramps, spasms, and/or pain occur. Do not take if pregnant or breastfeeding. Do not use prior to, or after, recent surgery. Do not use within 2 hours of other medicines. Keep out of reach of children. Do not exceed recommended dose. Overuse of CleanseSMART 2 may cause dependence for bowel function.